I read about this personality type in someone's blog. 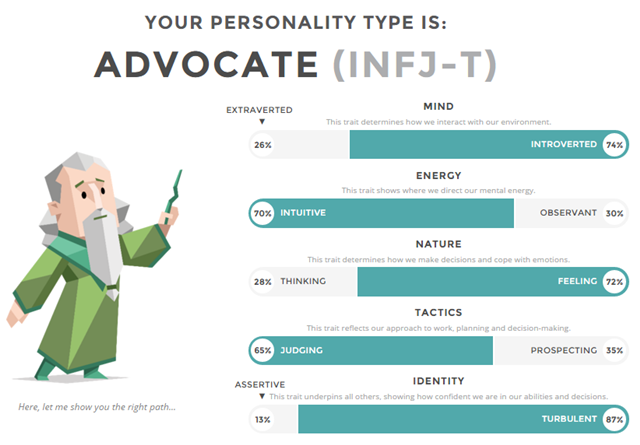 I don't remember which blog but I am so curious to know what personality type do I have. I tried to search on google and found the website. The test is to agree or disagree and it took less than 12 minutes but turned out to be 30 minutes for me :P And here is my result for the test. Almost accurate to myself hiks. "INFJs tend to see helping others as their purpose in life, but while people with this personality type can be found engaging rescue efforts and doing charity work, their real passion is to get to the heart of the issue so that people need not be rescued at all." I'ts creepy how accurate this is to me & my personality.